Montana has over 150 million square miles of land, and only a million people, which means it’s a state chock full of wilderness. The Flathead River, in northern Montana, boasts some of the best whitewater rafting in the state. The Flathead flows out of Glacier National Park, less than three hours from Missoula. The region is renowned for its stunning mountain scenery—in fact, many rafters choose to combine a raft trip with a visit to Glacier in order to see all that the area has to offer. The Flathead is a river with options. Gentle family floats are available on a different Class I–II sections of either the North Fork or Middle Fork of the river, lasting anywhere from a half day to several days. The North Fork of the Flathead is perfect for families new to multi-day river trips: the river is easy and gentle, and the scenery is spectacular. Because this is an overnight trip, participants should be at least 10 years old. A shorter, half-day Class I float is available on the Middle Fork of the Flathead, below the town of West Glacier. Because this option is so gentle—there are no rapids—it is suitable for children as young as three. For those with a little more time, and a thirst for more adventure, consider a half-day trip through the Class II-III John Stevens Canyon on the Middle Fork of the Flathead. This section takes approximately three hours, and has genuine whitewater thrills. Full day trips can also be arranged on the Middle Fork. Full-day trips start by rafting a remote section adjacent to the park where you’re more likely to see bald eagles than people, and also include the exciting John Stevens Canyon. For either option, participants should be at least 10 years old, though outfitters may lower the recommended age during lower water levels. Most Middle Fork trips start near the picturesque town of West Glacier, MT, at the western entrance to Glacier. Some rafters might also look for unique ways to fit a rafting trip into their visit to Glacier National Park. A local outfitter can help you find the perfect option, whether it’s spending one day exploring the national park on horseback and the next day in a raft, a combination of hiking and rafting, or overnight trips that combine camping and whitewater rafting. Water levels on the Flathead River depend on snowmelt; the season typically starts in June or July and lasts into September. No matter the section of river or time of year, rafters will delight in the experience of traveling through true wilderness in a raft. It’s not uncommon to see bears on the banks of the river (don’t worry—you’ll be safe in your raft! ), deer, elk, and all manner of birds of prey. The landscape is immense—as you travel through glacial-carved valleys with looming mountains in the distance, you’ll see for yourself why they call this Big Sky Country. 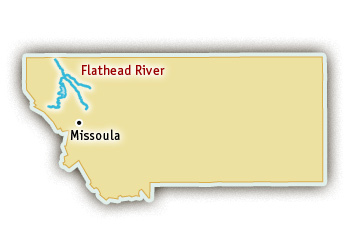 Much of the Flathead River is federally-designated as a Wild and Scenic River.